Ever since he was a child and first learned how to ride a bike, it’s been hard to slow down Ron Buliung. Now a professor of geography and planning at U of T Mississauga, Buliung is an avid cyclist. He is also committed to finding ways to help kids become more active. For almost a decade, with the help of public funding, Buliung has been looking at how children get to and from school. 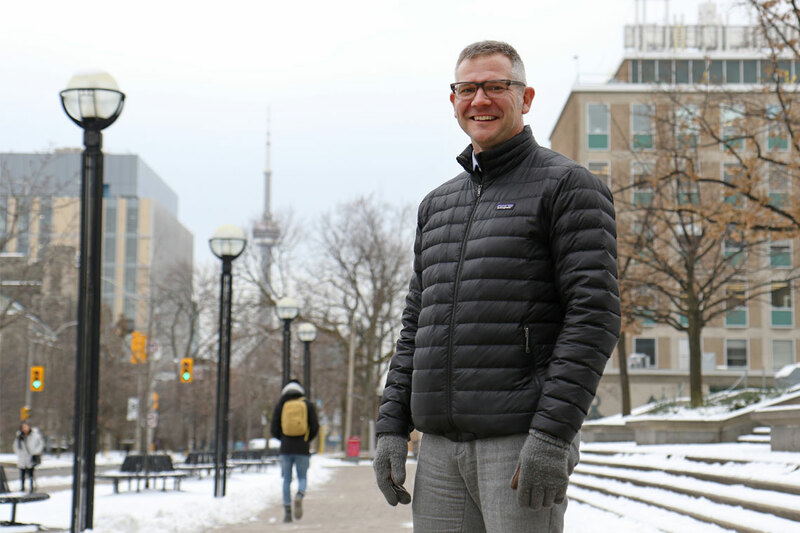 “I wanted to hear the voices of kids and help to bring their voices into the conversation about city-building in Toronto, but also across the region,” he says. His research into kids’ commutes continued with funding from Metrolinx, Southern Ontario’s transportation planning agency. The study showed that more than twice the number of students are now driven to and from school compared with 25 years ago. Metrolinx is aiming to get 60 per cent of kids to walk or bike to school by 2031 – a goal Buliung’s research will help to achieve. “This research increased our understanding of children’s mobility needs and barriers, helping Metrolinx and its partners to knowledgeably focus programs in the right areas,” says Leslie Woo, chief planning officer at Metrolinx. Buliung’s research also provides evidence that assists the Toronto District School Board’s promotion of safe, active and sustainable school travel, says Ryan Bird, TDSB’s manager of corporate and social media relations. “We know that those who use active and sustainable modes of transportation experience benefits to mental and physical health and well-being, are better prepared to learn and work and are more connected to their communities,” he says. Buliung says he wants his research to continue to inspire change in cities. But in order to build that foundation, researchers like Buliung need public funding to support their work, as outlined in Canada’s Fundamental Science Review report by a panel led by U of T President Emeritus David Naylor. The panel of experts provided the Canadian government with a list of recommendations on how to support the country’s academic researchers, which includes a $1.3-billion increase in federal research funding over four years. While public funding can lead to amazing discoveries, Buliung says it is also crucial for launching the careers of graduate students. “The bulk of the funding is going towards supporting our future generation of scholars or the next generation of city planners or people working for transportation consulting firms,” he says. Timothy Ross, a PhD student working alongside Buliung, says federal funding was a definitive factor for whether or not he would study at U of T.
Supported by the SSHRC Insight Development grant, funding from the Norman Saunders Complex Care Initiative at Toronto’s Hospital for Sick Children, and funds from U of T Mississauga’s Research and Scholarly Activity Fund (RSAF), Buliung's and Ross’s latest research looks at the school travel experiences of kids with disabilities and their families. For Buliung, it hits close to home. When his daughter Asha was 11 months old, she was diagnosed with a genetic neuromuscular disease called spinal muscular atrophy. Now six years old and in first grade, Asha rides the school bus in her powered wheelchair. “She has a lot more autonomy than many 12-year-olds – out of necessity but wow, that's just amazing,” says Buliung. Ultimately, Buliung wants his research to help make the lives of families like his more manageable. This can be as simple as providing schools with a checklist of the equipment and school supplies a child with physical challenges needs to bring home with them so parents don’t have to drive back and pick up missed items, says Buliung. “It doesn't have to be about building bridges, it can be about something as basic as that,” he says. Any small changes that come as a result of research today can make a big difference in the long run, he says. “A piece of basic research may become part of everyday life 25 years from now."